Peter again with another StudioMagic blog. As you’ve noticed, we’ve changed the name of this blog to “Clicks, Tips & Compositing Tricks”. We feel that the new name better encompasses what we set out to share here. 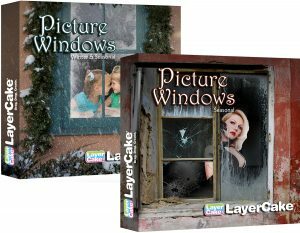 And speaking of sharing, Harry Kerker, President of LayerCake/StudioMagic is back again this time talking to us about StudioMagic’s Picture Windows. Prepare for new possibilities for your creations. Once again, here’s Harry. Remember location shoots? I do so maybe that dates me, but it wasn’t so long ago that we were dragging a van full of lights and assistants to some ungodly location at 5 am. Also the cost involved became prohibitive, few clients wanted to spend the extra money asking if maybe it could be done in a studio… which it couldn’t. Compositing in Photoshop changed all that. Now you can do that location work from the comfort of your computer desk and have a sandwich at the same time. In this article we’ll discuss creating virtual window studios. Window portraits have always been popular, but depending where you live you’re limited to what’s in the neighborhood. Many clients, especially high school seniors, are always looking for something different – “Put me in the Old West!”, “Put me in something edgy” – and brides may want something more sophisticated… hopefully. If you have a list of things in your head to look for like me, shooting cool windows is second nature. I snap them off on all my trips from San Francisco to San Gimignano. I try to shoot windows as straight on as I can, otherwise you may limit the subject you can place in it because of an odd angle. Now you have to start thinking layers. Remember understanding layers is the key to compositing. 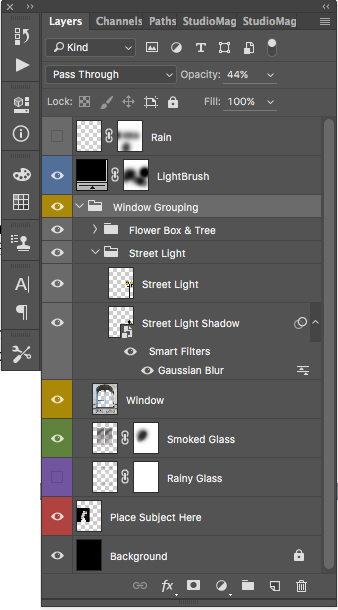 I named the company LayerCake because that’s what compositing is, making a cake of image layers. If you think of your image in a three-dimensional sense, and turned it sideways, it would be a layer cake. Once you visualize this, the whole process is much easier to understand. Start by creating a new layer for your window image. Select it, cut it and paste it on a new layer of its own. Fill the blank background layer behind it with black, you can always change it later if you want. Select your lasso tool and change the feathering to “0” so it’s a hard edge. You want to remove the glass from each windowpane. Click with your lasso in a corner and click around all four sides until fully selected and hit delete. 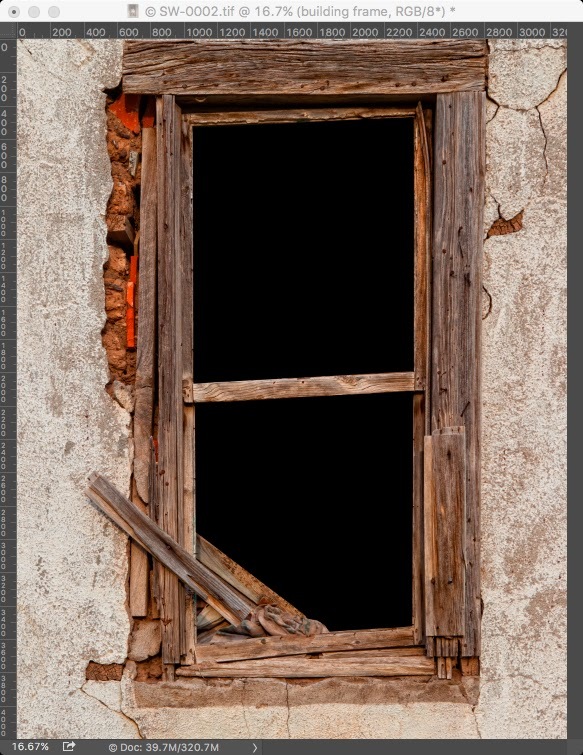 You’ll now see the black background we created showing through where the windowpane once was. Continue removing the glass until all panes are removed and save this new file as a PSD. Look through your portraits for subjects that you can at least see to their waistline. Now you probably have a strategy for doing the extracting from the original background, and there are many applications on the market for masking out people that tout ease of use, but few live up to that promise. In all honesty, Photoshop is still the best tool for masking, however if you’re not an experienced user it can seem complicated. The CutOut tool in StudioMagic 1was created to simplify Photoshop’s refine edge, by defaulting all the settings to those recommended to us by a panel of industry experts. It also gives you simple options like Auto CutOut for hard-edged objects and Detailed CutOut for things like flying hair on your model. 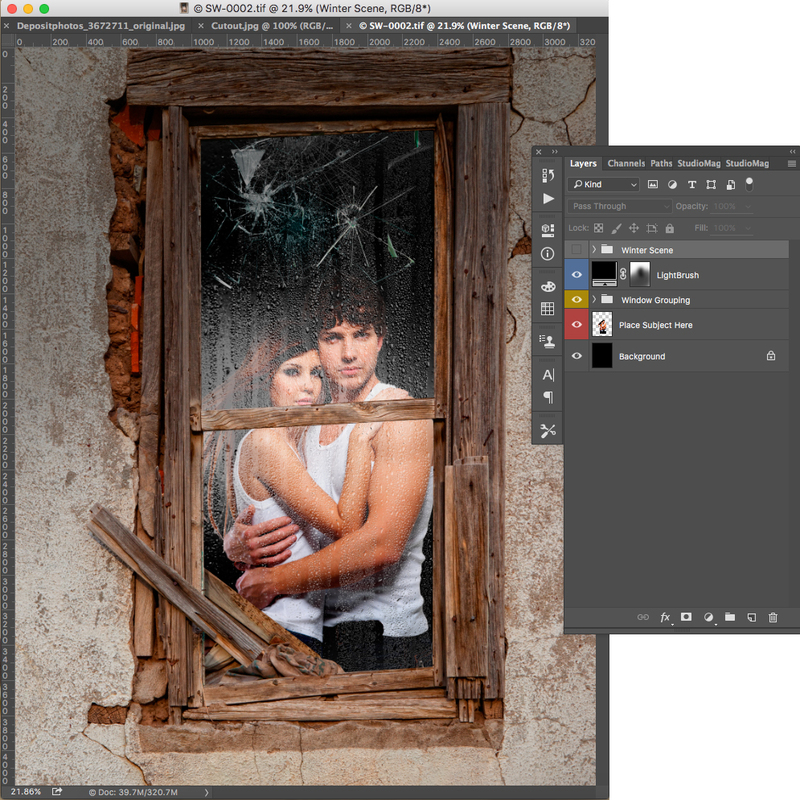 Once your subject is removed you can now drag the layer into your window composite. It’s a good idea to have the layer pallet open so you can see all your layers. Now lets think layer cake. 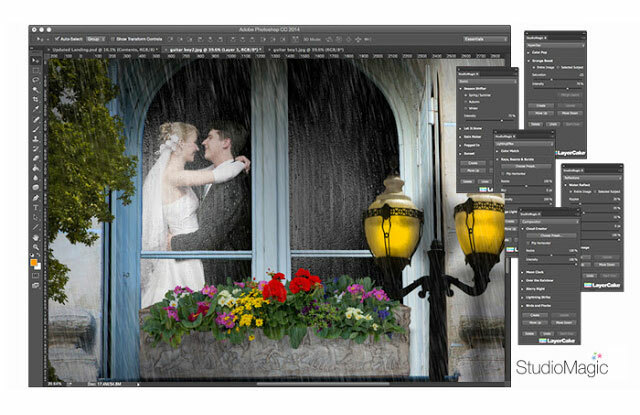 Select the layer with the window on it, then drag your subject from the other image on to the window composite. 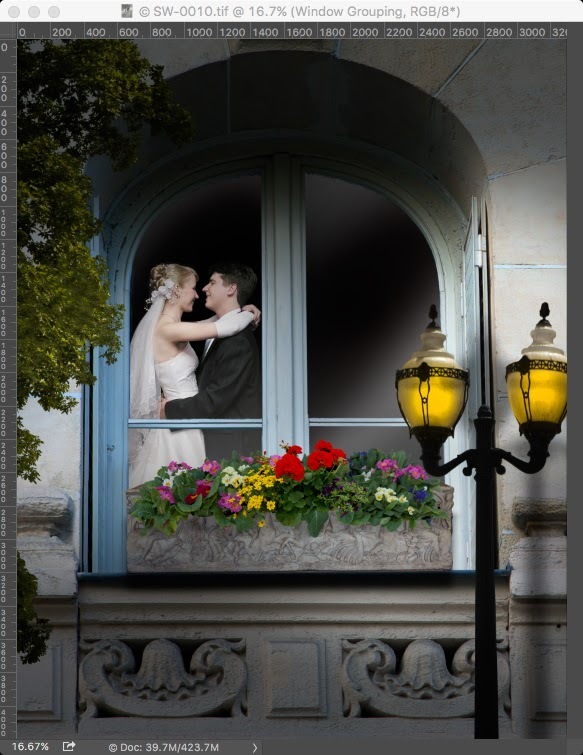 If you selected the right layer in the window composite, your subject should be inside the window with the black background behind. 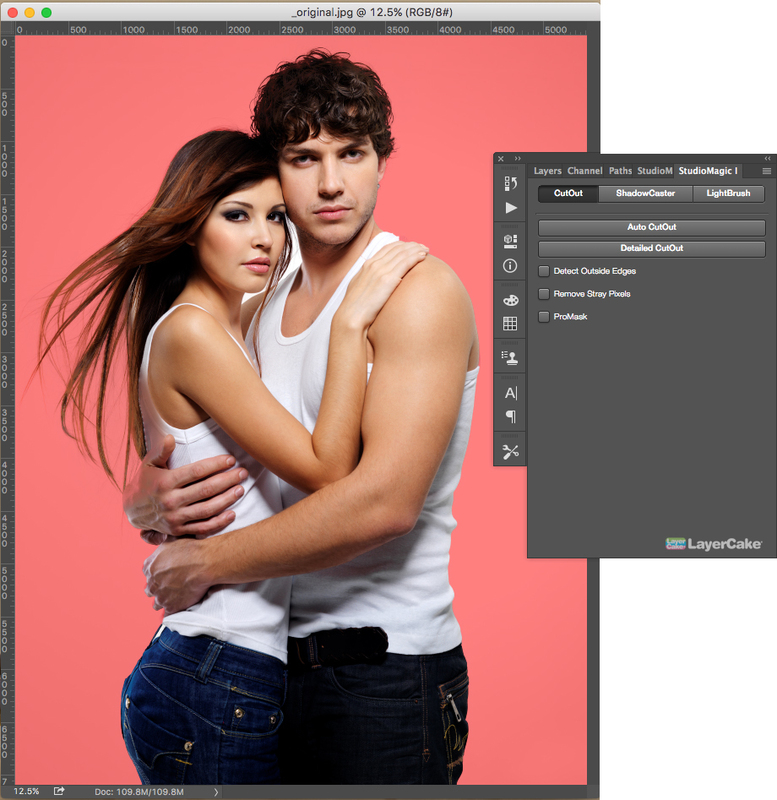 If not, look at your layers pallet and slide the subject between the window and the background and voilà. If your subject looks a little strange, ask yourself these questions. Is he or she photographed at the same angle as the window? Is the direction of the light on the subject coming from the same direction as outside the window? Is the subject sized correctly relative to the window? If the subject’s angle is incorrect, find a different outtake, a different window or reshoot the subject angle to match the window. If the direction of the light is incorrect, flip the subject direction in transform and use your dodge and burn tools to accentuate the highlights and shadows, which will fool the eye. StudioMagic 1 has a cool LightBrush tool which makes this easy, but you want to be sure that the layer mask it creates is behind the window and in front of the subject in your layer structure, otherwise you’ll have dark over the entire image. You just want the Light Brush Tool layer over the model. Relative size is a bit easier; try to determine the size of one pane of glass. An adult’s head is 8” to 10” high depending on age and gender. Size the subject’s head relative to windowpane size and it should now start looking more realistic size wise. Now if you don’t like the black background behind your model, change it using your bucket tool and pour in a new color or shoot a wallpapered wall to slip behind your subject. Remember this new wall should always be darker than the subject since it’s farther away from the window. If you want to cast a shadow on it, use the excellent ShadowCaster tool in StudioMagic 1, place a “Wall Back“ shadow on your subject and play with the angle slider until it looks correct. Lastly, every window needs glass. 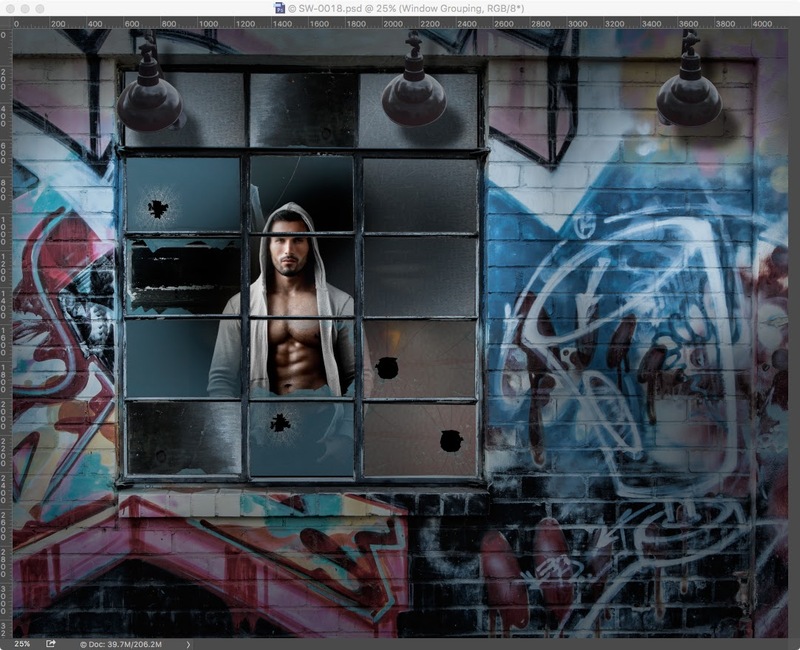 Make a new layer behind the window and in front of the subject. Fill the new layer with white. Add a layer mask to the new layer by clicking on the small icon that looks like a Japanese flag at the bottom of the layers pallet. You’ll see that a mask has been added to the right of the layer. Select the mask and reduce the opacity to about 20%. Now select your brush tool and make soft brush strokes at a 45 degree angle across the glass so you can see the subject’s face clearly. Repeat it in different areas of the glass. Now play with the opacity so you can see your work. If you want to paint glass back in, hit the X key on your keyboard and it’ll reverse the mask brush to paint back in. When you get it just right, play with the opacity until it looks like a reflection across the glass. Try making masks with gray and black as well, all do different things. 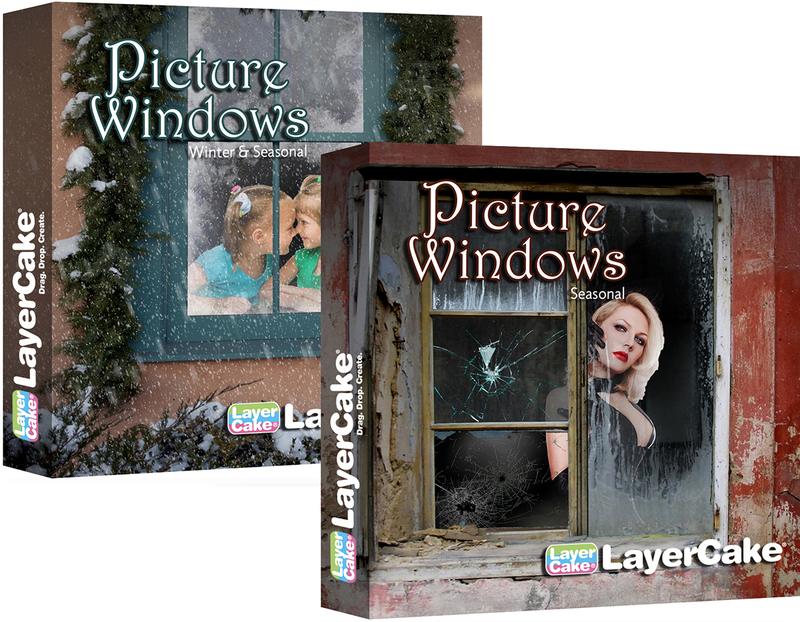 There’s great satisfaction making your own virtual windows, but you can get a great collection of PictureWindows right in our store, already composited with lots of fun layer options in summer and winter scenes, ready to drop your subjects into. 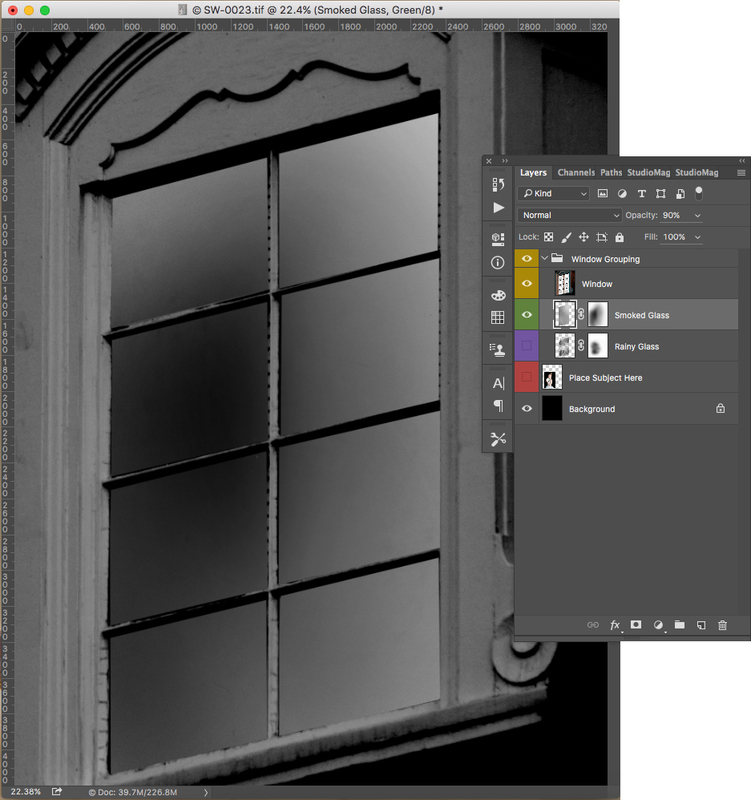 Add StudioMagic 1 & 2 and you have a virtual window-making machine! To see tutorials on PictureWindows, click here.